With the school year practically over, and people expounding on what should have been taught in school, but wasn’t because we have a bunch of idiots in charge, but just wait until next year, boy, will things be different then, you just wait and see...I thought I'd expound on something a bit different! Today, I'm going to spend my time with you conversing on more important things -- namely, TV Remote Controls and Homemade Ice Cream. Throughout the years, television brought into our living rooms Ozzie and Harriett, Ricky and Lucie, Fred and Barney, Young and Restless – and not once did these “stars” ever complain about Dear Old Dad sitting in his recliner, wearing nothing but his undershirt and boxers. And with that, the first ever Daddy-Controlled, Voice-Activated TV Remote Control Exercise Program was invented. Now, you might say Good Old Dad was lazy, but I say he was a visionary of childhood physical fitness. Yes, he could have gotten up from his recliner to change the channel, but instead he made the sacrifice to stay put – all for the good of his Little Johnny’s health. But then along came Robert Adler. Robert Adler invented the Wireless Remote Control – not to mention idleness, sloth, apathy, laziness, lethargy, and a whole lot of other synonyms that mean exactly the same thing. With Adler’s remote, Good Old Dad no longer needed Little Johnny to change the channel. And what became of Little Johnny? He got fat, forcing the government to pass “30 minutes a day of supervised exercise” legislation, and allowing dieticians to implement “healthy” menus consisting of things like carrots, corn and Trans Fat-Free Pizzas. But, in all fairness, Adler is not the only one to blame for the state of our children’s lack of physical fitness. We can also blame Thomas Edison and his hideous invention, The Electric Ice Cream Maker. In 1843, American Nancy Johnson patented the first-ever Hand-Cranked Ice Cream Maker, and soon our country became the envy of the world. But that was yesteryear. Today, with the advent of The Electric Ice Cream Maker, our country is financially weak, home foreclosures are at an all-time high, and we can't afford to send man back to the moon, much less send woman with him, which blows our plans to open up little Lunar Love Shacks for those who want to "get away from it all." And it's all because our children have no idea how to hand crank ice cream. 1. 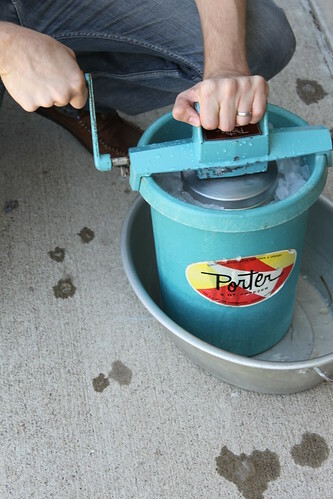 Hand-Cranking Ice Cream 101 – A 30-minute-a-day course required of all kindergarten through high school students. A state-mandated test should be given at the end of each year, ensuring that No Child Will Be Left Inside The House When Hand Cranking Ice Cream Needs to be Done. 2. Lose The Remote, Lose the Pounds – An ongoing program in which educators actively engage their students in the benefits of manually changing channels on classroom TVs. Channels should be changed 120 times a minute to achieve maximum heart rate. In conclusion, do you know what Martin Luther King, Jr., Bill Gates, Donald Trump, Walter Cronkite, Jimmy Carter, Amelia Earhart, Mark Twain, Paul McCartney, and Rahm Emanuel all have in common? Me neither. Just thought I’d ask.